The 2015 VIZIO SB4051 is similar to their S3851w that I reviewed last year. Bolstered by two rear satellite speakers and an amply powered wireless subwoofer, both sound bar systems deliver splendid surround sound that can effortlessly fill a medium-sized viewing room. The extra two inch length of the SB4051's sound bar makes this model a better match to TV's larger than 42 inches. Though if you rewarded yourself with a 65-inch TV, or even a more expansive one, than this sound bar - especially if mounted below - may look undersized. Don't be deceived, the SB4051's audio easily measures up to these big displays. In addition, the exterior design of all the components has been retooled with a matte silver cap that gives the SB4051 a cleaner, more elegant appearance over the previous year's model. Beyond the excellent audio quality that many might find surprising for such a sleek, reasonably priced 5.1 system, VIZIO supplies Bluetooth (with aptX) connectivity so you can wirelessly pair this unit to your Bluetooth enabled devices such as smartphones, tablets or computers and stream audio. Of note, unlike the S3851w, the SB4051 does offer an ARC (Audio Return Channel) compatible HDMI port, which allows you to connect to an ARC HDMI out on your TV and transmit video to the TV and audio back to the sound bar. Therefore, the TV (with the appropriate number of inputs) can act as your hub for switching between sources like a game console, set top box or Blu-ray player. The SB4051 also provides a separate HDMI input and two more digital audio inputs (optical and coaxial), and multiple stereo analog audio inputs. Therefore you can connect up to five devices (with the matching audio outputs) to the sound bar and switch sources with the SB4051 palm-sized remote control. Though that many wires attached to the back of the sound bar could quickly become unwieldy and unsightly. The designers of the SB4051 should be commended for adding the tasteful matte metallic accent to all of the components, which otherwise are stock black matte. It's almost a shame that the satellite speaker's diminutive size makes them so inconspicuous because they deserve to be noticed. Each satellite speaker contains a 2 ½-inch full-range driver. These units attach separately to the subwoofer with 25-foot audio cables, which allow flexibility in speaker placements. Inside the powered subwoofer is a 6-inch Long Throw (High Excursion) Driver with a port in the back. (Its Frequency is rated at 50 Hz - 20 kHz.) 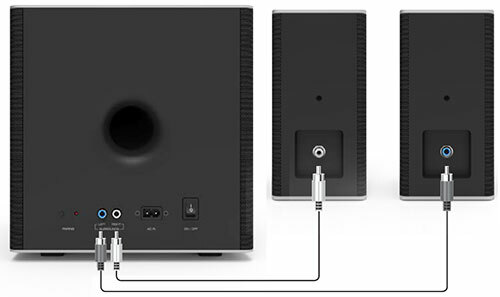 The subwoofer is paired wirelessly to the sound bar with a range of 60 feet, clear line of sight. You still need to plug the subwoofer into an outlet for power. The face of the sound bar is unadorned until it is powered on when you will see a column of indicator LED lights on the far left. They assist when setting controls like Treble, Bass, Surround and Subwoofer levels. The unit contains three 2.75-inch full-range drivers (one each for the Left, Right and Center channel). 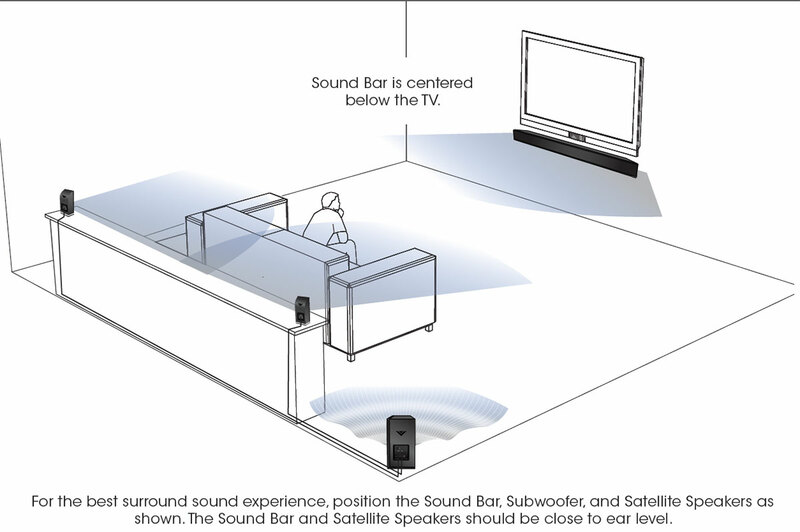 Sound Bar Frequency is rated at L&R: 90 Hz - 20 kHz, Center: 160 Hz - 20 kHz. And Sound Pressure Level is 102 dB with less than 1% Total Harmonic Distortion (THD). The system can decode both Dolby Digital and DTS Digital Surround sources. The audio enhancements include DTS TruVolume, DTS Studio Sound, and DTS Circle Surround. On the top of the sound bar is a group of operational buttons for Power, Input, Bluetooth Pairing and Volume. All of the functions can also be performed with the remote control. On the back of the sound bar are two connection panels. One of them contains two analog audio inputs (one RCA Stereo pair and one 3.5mm Stereo minijack). The other panel supplies one Digital Optical (Toslink) and one Digital Coaxial audio input. In addition, there's one HDMI In, one HDMI Out (ARC) and one USB port for playback of WAV audio files from a thumb drive or other device. VIZIO packages all of the cables necessary for you to hook the SB4051 up to your TV, including wall mounts for the sound bar. 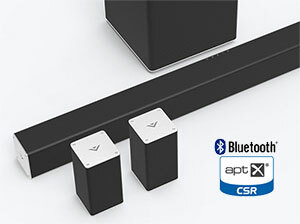 Integrated into the sound bar is a Bluetooth adapter with aptX® technology that lets you stream CD-quality music wirelessly. And if the source app or device supports track control, then the Play/Pause, RW, FF buttons on the SB4051's remote will control the source. The dark gray remote control with a silver surround is hide-under-the-sofa-cushion-sized, (1.675 x 5.5-inches). Considering that it only includes a few basic operational buttons, it really doesn't need to be any bigger except for the tiny screen. To the chagrin of my straining eyes, VIZIO has not improved the readability of the text display from last year's model. In low light - like a darkened viewing room - the not quite white letters on a not quite black background are hard to read. The display's contrast could be improved. Luckily, after performing an initial setup, you'll mostly use the remote to control the volume and those buttons don't require you to read the display. Also, the remote works in tandem with the display of LED lights on the front of the sound bar. For example, if you switch the remote control to Subwoofer mode, the two middle LEDs will illuminate indicating that the Subwoofer level is at the default of zero. If you increase the level on the remote, the illuminated LEDs will progressively move up. The variations of light patterns are diagrammed on three pages of the Quick Start Guide. Unless you are a sound bar savant, you should take the time to read the guide. Your first setup task is deciding where and how to place the sound bar. If your TV is not wall mounted, you could set the sound bar on the stand in front of the TV. 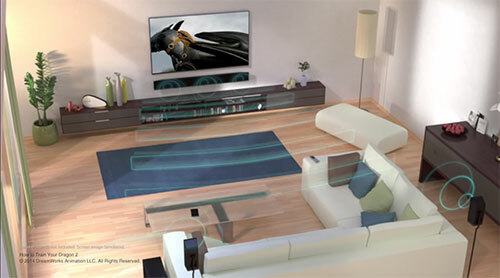 But the unit's 3-inch height could block the TV's remote control IR receiver. You can solve that problem if you mount the sound bar below the TV. If you choose this option, VIZIO includes the wall brackets and a mounting template. The subwoofer is wirelessly paired to the sound bar out of the box. In your planning, remember that the subwoofer must be within 60 feet of the sound bar, if they have a clear line of sight to each other. If you're pondering hiding the subwoofer behind a piece of furniture, the distance will be less. When you are planning the placement of the subwoofer, remember that the satellite speakers need to be wired to the back of it. VIZIO gives you 25-foot cables with ends that are color coded to match the inputs on the speakers and subwoofer. Once you have everything placed, connect the sound bar to the TV, ideally with either the HDMI (ARC) or one of the digital audio cables. Then go into your TV's menu and configure the TV's speakers setting to Audio Out. The VIZIO guide also states, "When using either of the Digital Inputs, if there is no audio: (A) try setting the TV output to PCM." Also, "Confirm that the audio output setting is set to FIXED or STANDARD, not VARIABLE." Now, to do a little fine tuning, power on the SB4051 and press the Menu button on the remote and scroll to Speaker Test. A voice will start identifying each speaker, followed by white noise. While you are confirming every component is working, you can listen to hear if the volume balance between the speakers needs to be adjusted. The SB4051 does not supply a microphone and audio calibration software, therefore you will need to make these adjustments the old fashioned way, by ear. To be thorough, you should step through all of the menu items like Treble and Bass and Eco Power. You can always come back to these features and reset them later. It should only take you a matter of minutes to tweak to your room. If you are connecting to the sound bar via Bluetooth, the manual explains the simple pairing process. It also warns that "a Bluetooth signal has a range of up to 30 feet." Also, please remember that not all audio sources deliver 5.1 surround sound. For example, some TV channels only broadcast in stereo. Therefore don't be surprised if you are not always hearing audio from your satellite speakers. I don't want to oversell the audio quality of the VIZIO SB4051, but I just sampled a number of sources and its performance is quite remarkable for a $350 5.1 surround sound system. It's especially effective playing back full-bodied movies like Star Trek Into Darkness, where the rumbling subwoofer and the small but responsive satellite speakers actually do "immerse" you in resonant sound. Though the subwoofer doesn't need to rattle the pictures off the wall to be effective. With less vigorous music passages, the subwoofer's deep bass character serves as the foundation to well-rounded audio. With certain songs, I thought the sound bar speakers were a bit too transparently bright. VIZIO does not supply any advanced audio adjustments, but adjusting the basic Bass, Treble and Subwoofer controls was effective in dialing in a quite satisfying sound. 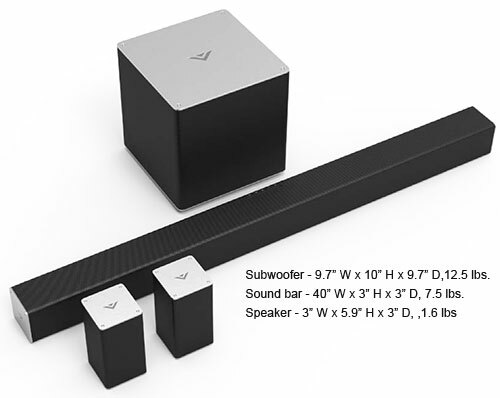 At $350, the VIZIO SB4051 5.1 Sound Bar System is a good value with excellent performance and the added benefit of wireless Bluetooth streaming. The audio output comfortably fills a medium sized room. And with five audio inputs, the SB4051 could act as the hub for your devices. As a bonus VIZIO packages all the cables you will need. The value of not having to run to Radio Shack for a digital optical audio cable - and then realizing the store is shuttered - is priceless. Realistically, if you are looking for a 5.1 surround system to power your home theater, you would be more appropriately served with a dedicated AV receiver/amplifier and a matched set of speakers. Then again, you could easily pay 3 or 10 or even 100 times more for such a kit. 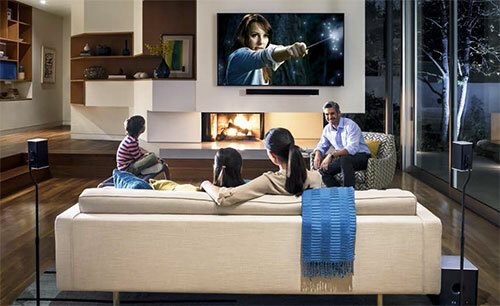 With its powered subwoofer, the VIZIO SB4051 sound bar system can truly immerse you in noteworthy 5.1 surround sound. 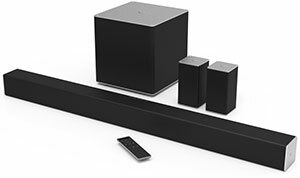 In addition to its Bluetooth (with wireless connectivity for tablets and smartphones, the stylish 40-inch sound bar provides multiple wired audio inputs for devices like a set top box, game console or Blu-ray player. The sound bar marketplace is overcrowded, but the SB4051's package of features and performance make it a fine value worthy of consideration. I realize this article is nearly a year old, but I wanted you to know it is appreciated. The previous comment about ARC, I had to read that same sentence a couple times myself. It makes sense but there's something confusing about it. Anyway, I was specifically looking for info about whether or not this unit had a built-in microphone. I saw it was something you detailed. Bonus, this unit belongs to a friend of mine. I got the SS2521 sound stand and he had to one-up me. He has had an issue with it not always outputting sound and I believe you may have touched on the cause (the aforementioned PCM setting). As a side note. I like the sound stand but the built in subwoofer likes to rattle anything nearby. The cable box seems especially prone to "buzz" when a TV show character with a low/deep voice speaks. Wouldn't be an issue if the subwoofer was separate as it is with this unit. Thanks for a useful, rather in depth article. You quoted the article correctly, but misread it. If you take away the first phrase, it reads, "...the SB4051 does offer an ARC (Audio Return Channel) compatible HDMI port." This statement matches the image. Hi, So, you stated "Of note, unlike the S3851w, the SB4051 does offer an ARC (Audio Return Channel) compatible HDMI port" except that down below is a picture of the back of the unit and very clearly I see "HDMI Out (ARC)". Does this unit have ARC or not?